ANWR is one of two large federal land parcels on Alaska’s oil-rich North Slope (or Arctic Slope). The other is the National Petroleum Reserve-Alaska (NPR-A). However, locals joke that Congress mixed up the names when it set aside the land, because there is more petroleum underneath ANWR and more wildlife in the NPR-A. For decades, Alaska politicians have urged Congress to open the northern, coastal portion of ANWR — known as Section 1002 — to fossil fuel development. That is where, due to underground geological formations, the chance of major oil and gas discoveries is highest. Technological advances in drilling, and innovations such as ice roads, have enabled the fossil fuel industry to access oil deposits with lower risk to the environment than was once the case. 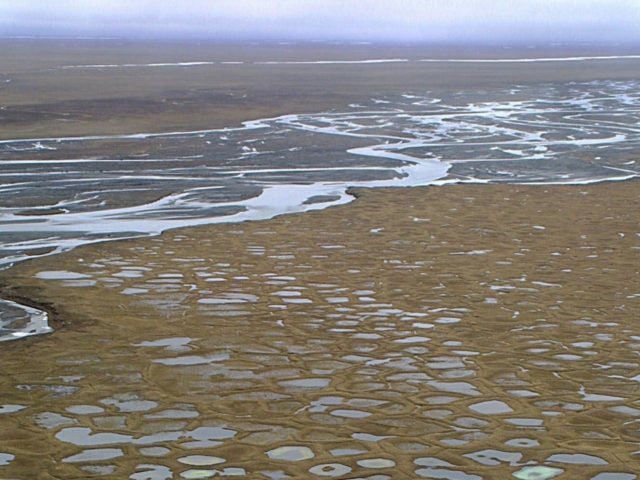 Environmental groups have opposed opening any part of ANWR to oil and gas development, arguing that it would interfere with migratory wildlife, and that fossil fuels cause climate change, which in turn warms the Arctic. Alaska’s politicians have argued that the nation needs the resources under ANWR — and that Alaska needs the jobs. But every time Washington seemed ready to open ANWR, it backed down — until now. Sen. Lisa Murkowski (R-AK) delivered the achievement that had eluded even the legendary, late Sen. Ted Stevens (R-AK). In a speech on the floor of the Senate late Tuesday night, Murkowski called the ANWR provision a “multi-generational fight” to authorize “a program for responsible energy development.” She noted that the 1002 area contained an estimated 10.4 billion barrels of oil, which would help meet the nation’s energy needs. And she added that opening ANWR would create thousands of high-wage jobs in Alaska and elsewhere. Murkowski also noted that future oil and gas development would still have to go through environmental impact review, and would need to be pursued in consultation with the Iñupiat Alaska Natives of the area, centered around the village of Kaktovik. Thousands of protesters rallied Dec. 6 on the north side of the Capitol grounds. But ignore that huge crowd, because it has nothing to do with the Arctic Refuge. That was about immigration. If you walked over to the west side of the Capitol grounds, to the National Mall that day, you’d find a much smaller group of activists calling for the preservation of the Arctic Refuge. The event was billed as a prayer vigil. Few reporters were watching. The mood was somber. It’s a stunning reversal of fortunes for environmentalists. They won so many times on the ANWR, some years they seemed almost invincible. It was commonly believed that it Stevens could not open ANWR, no one could. But Donald Trump’s presidency has created many new possibilities — and too many targets at once for left-wing outrage. The tax reform bill will need to be approved once again by the House before it goes to the president’s desk, because of a few provisions in Tuesday’s House bill that fell afoul of Senate parliamentary rules for a simply majority (“reconciliation”) vote.